NASA has its sights set on returning to the moon, first with robotic landers and then with humans. 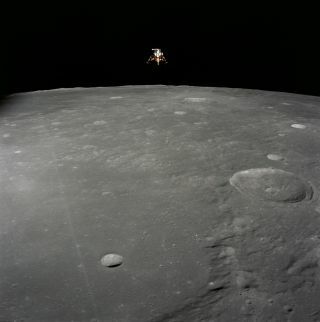 Here, the Apollo 12 lunar module orbits before landing. The first commercial U.S. landers to touch down on the moon should do so by the end of 2021, and they have a long list of scientific questions to tackle when they do. That's the takeaway from two reports released today (Feb. 7) by the National Academies of Sciences, Engineering and Medicine. The reports address the status of lunar science after President Donald Trump's Space Policy Directive 1 (SPD 1), which put NASA focus on returning to the moon — first sending robots, then humans — with the help of commercial partnerships. Those discussions suggest that the first wave of commercial lunar landers could carry payloads of between 22 and 220 lbs. (10 to 100 kilograms). The payloads would likely remain where they landed (except perhaps for some small hoppers that could move around) and would be unable to survive the harsh lunar night, which lasts two weeks in Earth time. But such payloads could still do valuable science, the panel behind the new report argued. The science community has agreed on nine top-priority topics they want to better understand about the moon, from its formation to how it has been hit by meteoroids over the millennia to what resources humans may be able to tap into if they visit. And those topics are profiting from NASA's pivot in response to SPD 1, the first paper concluded. The first step in response to SPD 1 may well be science cubesats that could fly to the moon on NASA's own Exploration Mission-1, the first flight of the massive Space Launch System rocket. One such instrument is already due to map hydrogen across the moon's surface. Even the first generation of commercially ferried instruments could make important contributions to those questions, the second paper concluded. For example, the first commercial landers could place retroreflectors, which are basically sophisticated mirrors, that scientists could use to more precisely measure how Earth and the moon interact. Other early payloads could also take snapshots of lunar environmental factors, like the solar wind, radiation and dust. Once those landers can survive through the frigid lunar nights or deploy rovers able to explore the surface, they will open up still more scientific potential. Rovers, even short-lived ones, could explore lava tubes, which people in favor of human exploration of the moon hope could protect astronauts from harmful radiation. And once longer missions become possible, payloads can mimic the work NASA's InSight lander's seismometer does on Mars, monitoring lunar meteorite impacts. And the committee was clear to emphasize that while all of these initiatives will be valuable for lunar science, the moon-focused SPD 1 has yet to push forward a crucial class of missions. For 15 years now, scientists have endorsed two specific mission concepts for lunar science, each of which would cost up to $850 million. One of those missions would bring a sample back from the South Pole-Aitken Basin region, the same area of the moon where China's Chang'e 4 mission is currently exploring; the other mission would place a network of landers on the moon to help researchers understand the lunar interior. Neither mission is currently on NASA's docket, and the smaller commercial missions discussed so far would not provide the same scientific returns, the reports noted. Scientists interested in participating in the commercial lunar program are currently preparing proposals for scientific instruments to fly on the commercial landers. The proposals were originally due last month, but the deadline was extended to Feb. 27 after the federal government's 35-day partial shutdown.